Dahakha perched on the edge of the cliff, peering through beady bird-eyes down at the Drag. Periodically he twitched his head around nervously, watching for any signs of recognition from the guards, patrols, and general passersby. It was a gamble simply being here, but he could see no other option to avoid a hermetic existence in some remote wilderness. 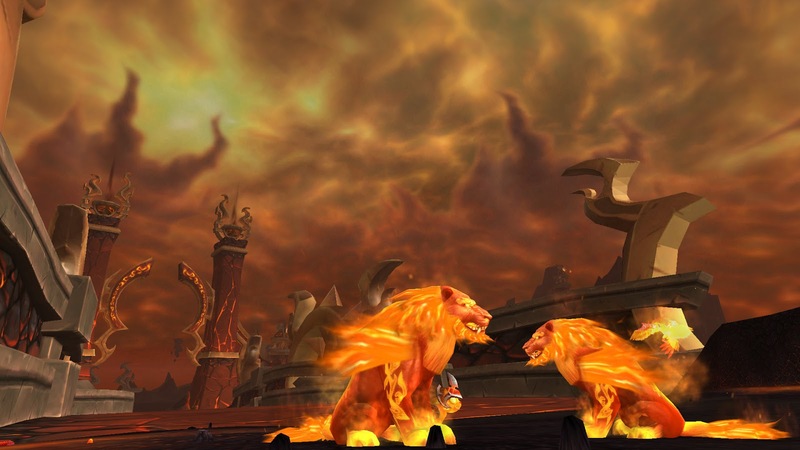 As long as he remained in one of his animal forms, and didn't run into any high-ranking druids, he was fairly certain that he would blend in as just another visitor to Orgrimmar. After the rude shock of finding that his guild headquarters were not where he remembered them being, it had only taken a few minutes to locate the HQ of this dimension's guild, and now he was looking for a familiar face to show itself. He brooded over his predicament as he waited. Sometimes he still thought he was dreaming, stuck in some never ending nightmare.....or that, perhaps, he was actually, completely mad. Insane, even. But the familiarity of his surroundings always restored his confidence in reality, however bizarre it was turning out to be. Every so often something jarred his perception, reminded him of the same-but-different nature of the world he was now living in, but he was surprised to realise that those moments were becoming less frequent and less intense. Obviously his long experience with the uncertainties that defined engineering had inured him to such shocks. The thought made him chuckle-chirp to himself quietly. It was engineering that had got him into this in the first place! After a long night in conversation with Unoke, the windrider master at Thunderlord Stronghold, Dahakha had left in a daze that had little to do with the Mulgore firewater they'd downed together. Clearly the world he was in was not the one he'd been in the previous day. Moreover, from what his old friend had told him, it would be dangerous to make himself known to Horde authorities. What pained him the most though, was the idea that he was cut off from the Cenarion Circle as well. He'd meditated on it for a number of days, then decided to end the nagging doubts by investigating Unoke's claims himself. Finding himself a cave – not much larger than a niche – in Nagrand from which to base himself, he journeyed back through the Dark Portal to Mulgore. Finding the junkbox at the grave had been a shock. Was it her? Could she....he risked a foray into Thunder Bluff to seek out answers. Returning to the grave, he had intended to replace the offering, but found himself unable to relinquish the only reminder he had of her. With a mixture of hope and reluctance, he returned to Nagrand and continued to meditate on the matter. Finally admitting to himself that he had no real understanding of what had happened, and unable to seek help from his usual sources, he had decided to consult with the learned ogre-magi of Ogri'La. It had taken months, but eventually Dahakha was persuaded that his wormhole generator experiments had......succeeded....in a way that he had not been able to imagine. Of course, as an engineer he was familiar with dimensional travel, but the possibility of it taking him to a whole new reality was completely new. Unfortunately, the ogre-magi could not offer anything except condolences when he started exploring ways to return home. Apparently there were, in theory, an infinite number of realities, and they counseled him against trying to duplicate his experiment as the chances of him finding his home again were vanishingly small. With a heavy heart, Dahakha had thanked them for their help and taken his leave. Now here he was, trying to see if he could contact guild members and start a new life with them. He fought down another surge of panic as the thought flashed through his mind yet again that his friends might not be in this guild, might not even exist in this world. He calmed himself with the reassurance that his closest friend, the one he could trust absolutely with his situation, was alive and a member here. Now he just had to find her, and hope that she would speak to him again, after that......no, no, it could be different here. He prayed that it was different, one of the few things he'd be glad to see changed. Shuffling along the edge of the cliff, he became suddenly impatient. Where was everyone?! He hadn't seen anyone enter or leave the HQ for hours! In fact.....the entire city seemed rather empty. Abruptly tired of waiting, he fell forward, gliding down to the guild entrance. Flowing into lionform, he padded through the door, searching the building for signs of activity. Hmph. Nothing. Glancing through some open doorways to sleeping quarters, he got the decided impression that most people had been away for a goodly amount of time. This was very odd. He needed some answers, and unfortunately that meant risking talking to strangers. Trotting outside again, he made his way down the Drag, considering his options. A merchant would probably be best, he mused. Spotting a tauren walking away from one shop, an Earthen Ring tabard proudly displayed over her armour, he quickly barged in before he lost his nerve. There was a startled orc just inside on his way out, and the orc at the workbench was half out of her seat, though she seemed more angry than surprised at his sudden entrance. The orc at the door glanced back at her. "Remember, no slaughtering customers!" With a straight-faced wink at Dahakha he left the shop. Sitting on the floor beside the entrance, Dahakha realised belatedly that he would have to give up his animal cover if he was to get any information here. The orc frowned at his silence. "Can I help you at all, druid?" With a sigh Dahakha flowed back into his tauren shape, twitching and poised for flight if any sign of recognition showed in the orc's face. After a tense moment, he relaxed slightly and spoke. "Greetings. I have...been away for a substantial amount of time, and I return to find the city much less busy than I remember it being. I was hoping you could enlighten me on the reason?" The orc's eyebrows raised incredulously. "You haven't heard?" Dahakha scowled. "Obviously not. Is there some news of Deathwing? Has Ragnaros finally been defeated?" At this, it was the orc's turn to scowl. "Har har, your little joke is about a year old now, druid. Stop wasting my time." She turned back to her seat, muttering scornfully under her breath. Dahakha stood in confusion and mounting indignation as she sat down, pointedly ignoring him. His mouth opened and closed silently, torn between answering this rudeness and the need for answers. Finally he settled for shifting into a lion and giving vent to an almighty roar of frustration. The orc did not look impressed at all. She waited until he shifted back, then pointed at the door. "If you don't have work for me, then leaving would be a good idea." Dahakha took a deep breath. The orc gave him a warning glare, and he let it out again, shoulders slumping. Gathering himself, he said "I apologise for giving you offense; it was not my intention. As I said, I have been away for a long time, and I find all my friends gone. The city seems almost deserted. I have no idea where they could have gone. Anything you could tell me would be most appreciated." The orc stared at him appraisingly. Finally she spoke. "Someone found a new land. The Warchief sent an expedition out there to claim it for the Horde, and after the relative peace after Deathwing was killed, I'd imagine your friends - along with most of the adventurers and thrill-seekers in Orgrimmar – went to see the sights." She waved vaguely at the door. "There's some sort of ambassador in the Valley of Honour, they can probably tell you more." Acknowledging this dismissal, Dahakha bowed his head in thanks and with another mumbled apology flowed out into the Drag again. Making his way to the Valley of Honour, he quickly saw the camp of the newcomers. An apprentice mage was nearby, maintaining a portal. Approaching him cautiously, Dahakha asked where it led. 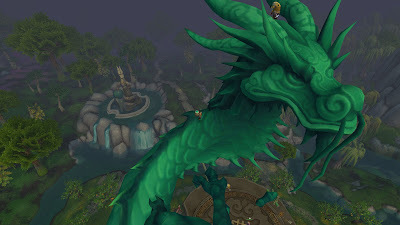 "Pandaria, of course!" the blood elf snapped, not bothering to turn around. "No, I can't issue passes! ", he continued before Dahakha could say anything more. "Get one from the Warchief's hall." Dahakha turned away, disappointed. After a few steps he brightened. The merchant had said the Horde had an expeditionary force there....they would need supplies and reinforcements. All he had to do was find a ship to sneak aboard. That shouldn't be too difficult. Finally having a purpose and a plan felt good, and some of the tense weight on his mind eased a little. He turned his attention to the new arrivals, studying the Pandaren delegation curiously. Their friendly demeanour invited his approach, and he decided to see if he could learn anything useful about this new land. Again he was disappointed, though, for these Pandaren were only slightly more familiar with the Pandaria of today as he was. When they asked him about himself, he remembered his danger and quickly excused himself, hurrying off. In which some cows get tipped tipsy. This was cobbled together from a series of recordings in an effort to appease the MP3 Skype Recorder gods. I apologize for some weird garbled bits in the middle and hope you can understand that part! Towards the end the audio gets a little garbled as it speeds uncontrollably on into the sunset. Despite a very entertaining Saturday night conversation, the second half of the audio is completely unintelligible. For that reason, we bring you the first 45 minutes now and will have to re-record the rest later this week. I'm so very sorry for the inconvenience! As he fell into the blackness of sleep, the words echoed once more in Hadakha's mind. The first dream exploded into being. He was surrounded by fire, screams, missiles zipping through the air past his head. It took a moment to register that he was on an airship, and that it was under attack. People were running about madly, trying to find weapons, put out fires, repair damage, yelling orders. He caught sight of Akabeko, sitting in a gunner's chair, while Weipon loaded the cannon with ammunition. He started forward and began calling out to them, but a massive explosion slammed the ship sideways, sending a screaming Weipon over the rail. She cannot control her forms. What use is a druid who has lost her abilities? Now he was in a pandaren tavern drinking room, sitting next to Akabeko, with Weipon across from them. Crowds of curious pandaren surrounded them, eagerly refilling mugs with strongly-spiced ale, clamouring for information about the foreigners. He turned to the tauren woman and heard himself say something in Pandaren, which triggered a snort from Weipon. After a brief exchange, Akabeko turned back to him with an overly cheerful smile, grinding out "I'm going to kill you in your sleep!" from between gritted teeth. She clinked his mug before downing her drink. Threats of violence? Murder?! Is that really how an Archdruid should behave? Do you really want a drunkard guiding you? Making important decisions that affect the lives of others? He watched as Akabeko and Weipon stood together, bending over a map in the tauren's hands. Akabeko looked around, confused, and scratched her head as she tried to figure out where they were. Suddenly Weipon pointed at the map and exclaimed something, gesturing in agitation. The druid looked around again, doubtfully, then shrugged. Packing up, they set off, the pandaren woman striking out confidently while Akabeko trailed along obediently. A druid who gets lost in a forest? How can such a one be considered for promotion? Akabeko leant over the decayed body of a Forsaken woman, trying to determine the extent of her wounds. He saw her mutter under her breath and gesture, then wince. She closed her eyes and her face tightened with effort as she struggled to cast a healing spell. Finally she finished, but the strain left her panting in exhaustion, and the glow of her hands as they hovered above the Forsaken was pitifully weak. How could one so weak in ability even interest the Council? He looked down at the bloodied tauren, kneeling on the floor before him, eyes downcast as he smashed his fist into her skull. She rocked back, then straightened again, still looking dully at the floor as he laughed and raised his fist once more. She has no passion! No care! No will to fight back! A horn sounded across the temple grounds, drawing Weipon's attention from questioning another gaggle of monks. Their brief conversation finished, they turned to continue their survey of the area for more tiny sha, and Weipon shook her head. Akabeko nodded, frowning. "Did you hear that trumpet? Does that mean what I think it does?" "I think we're out of time," Weipon agreed. "If we want to go into the Temple, we will have to go back there now, without Hadakha." Unable to hide her frustration, Akabeko turned and made for the Temple. Weipon followed, quietly glad that her friend was willing to help with this. Perhaps she realized how important the task was to the pandaren, or perhaps she felt responsible, in her own way. 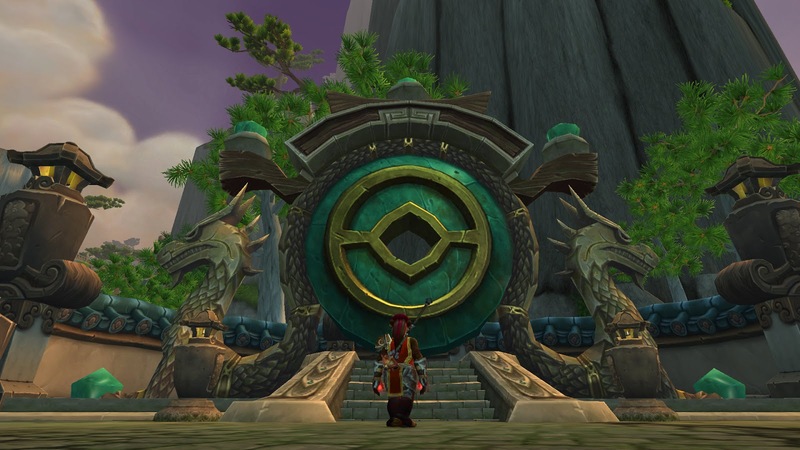 Cho was standing near the monks assembled, waiting patiently compared to the agitation radiating from the other pandaren. He caught Akabeko's eye and raised an eyebrow inquisitively. Find him? She shook her head briefly, lips pulling downward. No. Weipon recognized many of the monks from her earlier training, and she quickly went to stand beside them, exchanging tight smiles as they formed small ranks. Akabeko made to follow, but one of the trainers held out a hand. "Oh no you don't. It was you fools that got us into this mess. I won't have you bringing even greater offense to the Temple by coming inside with us." Although she couldn't understand the words, Akabeko clearly got the message. She shot a pained glance at Weipon, then looked back to the trainer. "Please," she said, calling on her meager Pandaren. "Please. I will help." The trainer regarded the tauren scornfully. Weipon spoke, "She is a healer, and dedicated to cleansing this taint from the Temple. Both she and another foreigner were responsible for clearing the battlefield." "After being the ones to cause the problem in the first place," the trainer responded, not breaking her scrutiny of Akabeko. But the lines around her mouth softened, and her gaze grew contemplative, measuring. "We don't have time to waste on this. She may come, so long as she works twice as hard to prove herself." Spinning, the trainer strode to the head of the gathered assault group, conferring with the other leaders. "Open the gates!" shouted the another trainer, motioning ahead of himself. "We're going in!" They marched forward as one, and Akabeko glanced around before joining Weipon. "Thanks," she whispered, falling in step at the edge of the row. Inside the temple proper, they were assaulted by the sour stench of sha, seemingly radiating off the very stones. Some of the pandaren groaned, holding their stomachs as the foul odor struck them. By now used to the disgusting scent, Weipon merely wrinkled her nose and tried to breathe evenly through her mouth. An unsettling slithering noise from down the hall drew their attention. "Serpent trainers, ahead!" a trainer called, directing the monks and their young cloud serpents into the murky darkness. There was a high-pitched shriek, followed by sounds of a struggle, and then the hallway noticeably brightened as the sha's influence receded and their corpses dissolved into mold. The serpents returned to their companions, looking ferociously pleased. The leaders divided the pandaren into teams in order to split up and traverse the temple faster. Weipon pulled Akabeko into a group with Peng and a handful of monks she had met during training. They stood clustered together while the serpent trainers were assigned groups, and then the same instructor from before joined them, glancing pointedly at the druid. "We are going directly to the main hall. The other teams will meet us there if they finish flushing out the other wings. Be on your guard." They advanced into the wide training ground, now filled with corpses being feasted upon by clusters of sha. Someone near the front gave a strangled cry, alerting the sha to their presence, and in the next moment they were swarmed by shadowy monsters with seeking mouths. Now adjusted to the unpleasant work, Weipon stepped forward, flanked closely by Akabeko, and waded into the fray, punching and kicking at the sha in her way. She noticed her friends hesitantly falling in beside her, drawing courage from her. At first, they shied away from not only the sha, but Akabeko as well, clearly cautious of her feral-looking form. However, the longer she fought, pouncing from foe to foe, the more they eagerly followed her lead, picking off any stragglers she missed. Weipon lost track of time as they put down sha after malignant sha. She concentrated on her form, on her strikes, on the movement of her comrades in their dangerous waltz with the shadowy monsters, anything to distance herself from the vile task of pulling the creatures from the quickly-rotting corpses of fallen pandaren. At some point, she realized that there were no more shadows for her questing fists to fight and came out of her trance, blinking slowly and taking in the equally exhausted pandaren around her. One of the instructors surveyed the carnage in the courtyard with a pained expression. "We will return to put this to rights after we have dealt with the Sha. For now, we will continue into the main building." 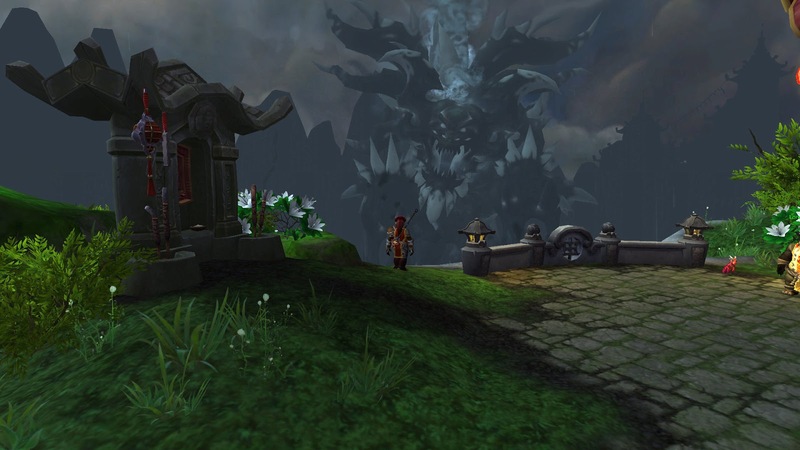 He turned to stride into the building, but pulled up short when a pandaren stepped from the shadows along the walls. Liu Flameheart's typically stern face was contorted into a fearsome scowl, her fur lifeless and shot through with sudden and premature gray. She looked at the gathered group without recognition, features drawing deeper into a sneer. "Your forces are weak," she bit out, leaping forward to strike at the nearest monk. With a shout, the battle began. It became quickly apparent that the cloud serpents would not fight the very priestess that had trained and cared for them, and their monk partners found themselves herded back by the agitated serpents. Where they reluctantly gave way, more monks stepped in to meet Liu's rapid, unceasing attacks. Despite being one against many, the Sha's influence over Liu made her a terrifying and formidable foe. In the blink of an eye, she took out an entire swath of opponents, jabbing at vulnerable throats, shattering wrists and knees, turning weapons against their wielders. Weipon could see Akabeko moving in and out of the fray, dodging and weaving amongst the upright crush of bodies surrounding Liu. The Sha-controlled priestess was evidently confused by the ostensibly wild creature stalking her from behind the other pandaren. It provided the perfect opportunity: she stumbled, falling to one knee, and was immediately set upon by the three closest pandaren. They brought Liu to her knees, and Weipon felt sudden terror claw its way up her throat. Until now they had merely been fighting to defend themselves, but what would they do to their former comrade? 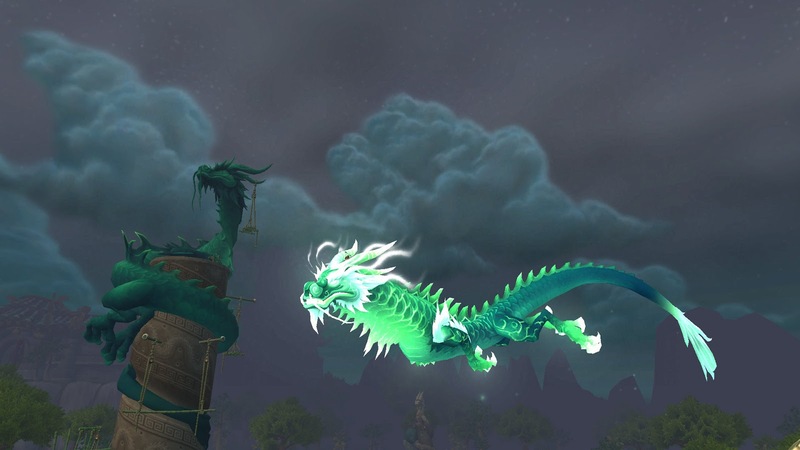 "The cycle must continue, the Jade Serpent must be reborn!" Liu announced, unseeing gaze sweeping across those around her. Before anyone could respond, the area around Liu was bathed in gentle, calming light as Yu'lon's misty apparition wavered into existence. The Jade Serpent coiled her sending around her priestess, cutting her off from the monks and pinning her arms and legs into stillness. Liu's mouth hung open slackly, her eyes unfocused. Yu'lon nudged her ghostly nose against the pandaren's forehead, sniffing audibly. "Be free of doubt, priestess," she murmured. With a whuffling sound, she exhaled softly against Liu's forehead, breathing color back into her ashen features. As suddenly as it had come, the sending dissipated, sending out a tiny burst of rejuvenating green dust. Liu crumpled bonelessly to the floor. The same monks from before darted in, this time to check the priestess's condition. She lay limply on the floor, her breathing labored and shallow. The young cloud serpents complicated matters by rushing back in to sniff and nip at their injured master, preventing monk healers from getting close to assess her injuries. Without warning, the cloud serpents darted back in surprise, revealing an unusual purple glow threading its way around Liu's body. The monks began to mutter in concern, but Weipon's eyes were drawn immediately to Akabeko, who was standing at the edge of the group, concentrating intently. Weipon limped gingerly over to her friend, not bothering to disguise her curiosity now that the druid's attention was elsewhere. She hadn't yet had the opportunity to simply watch while Akabeko performed her unusual healing. It didn't seem to be going easily, however. Akabeko's fists clenched and unclenched, fingers crooking this way and that as if she were attempting to navigate some puzzle. Her brows drew together and she let out a low growl of frustration. Unconsciously, from under her tunic she fished out a brittle-looking seashell and rubbed it between two enormous fingers. By now, it was evident that the druid was attempting to heal Liu but was having difficulty. Belatedly, Weipon remembered the little bell she still had tucked away in a belt pouch and brought it out, mentally berating herself for not thinking to use it sooner. She let it chime in Akabeko's direction, drawing the attention of the other monks. At the same time, Akabeko inhaled sharply, eyes widening as the calming sound had its effect. She cast several spells in quick succession, face composed and movements economical. When she became still, there came a quiet groaning from within the group of monks as Liu Flameheart came to her senses. The monks began to cheer, gathering around the druid as well as their exhausted but sha-free priestess. Weipon saw one of the trainers clap Akabeko on the shoulder, and she giggled when some of the cloud serpents showed their appreciation by nuzzling at the tauren's face and neck. She could hear the monks' praise, and although it was clear Akabeko didn't understand much of it, she nodded politely and smiled at each person. Now, the same trainer that had ordered Akabeko to leave stepped forward, half-supporting a weak-but-alert Liu. 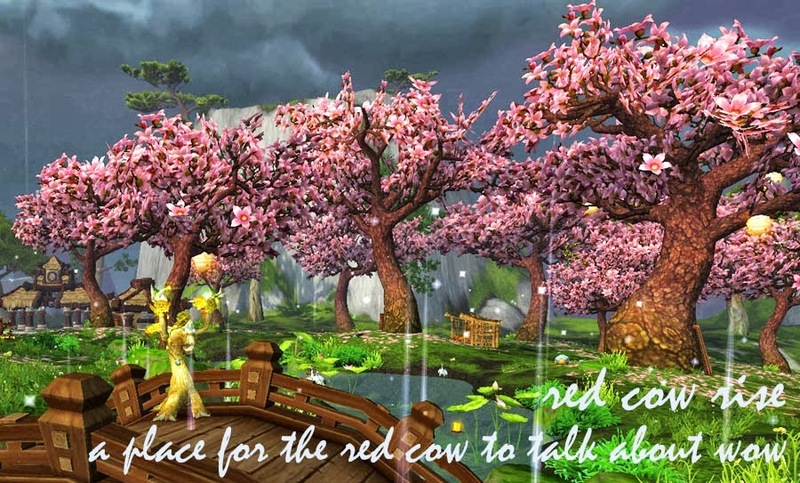 She nodded at the tauren, adding, "It seems you did have something worth contributing. Thank you." Akabeko bowed graciously, and Weipon was secretly pleased that at least some of her cultural training had stuck. The pace picked up again as the instructors rallied the remaining able-bodied troops. They had to leave many of the monks behind due to wounds taken at the hands of either the sha or Liu, and the body count was already regrettably high. Those well enough to press on gathered again to venture deeper into the temple, leaving behind their weakened comrades to rest. Weipon took the opportunity to attach the bell to her belt, hoping that it would continue to jingle while she fought. Peng noticed this from his place beside her and nodded at the bell with a questioning look. "It's something from Lorewalker Cho," she told him quietly. "I don't know what's special about it, but it seems to weaken the sha. I wish I had thought to use it earlier!" Before he could respond, the massive doors to the large hall they were in slammed shut, and out of the darkness rose an even inkier black shape, crackling white as if shot through with lightning. The Sha of Doubt towered over them, smaller than it had been on the battlefield but still oppressively large for the room. The doors to the hall shook violently as something slammed against them from outside. "You're too weak to follow me in here, my jade jailor," the Sha rumbled sweetly. Its breath stank of dead and rotting things, compounding with the fetid stench rolling off its putrid body. From beyond the doors came the answering cry, a mind-numbing, blood-curdling roar that for all its power could not open the doors. The Sha of Doubt extended two shadowy arms, comically long and jointed in too many places. "Die or surrender," he told the pandaren. "You cannot defeat me." Undaunted, the monks attacked as one. They surrounded the Sha, pummeling its slimy flesh. The bell on Weipon's belt chirped merrily, making the Sha quiver and flinch. It half-turned towards her, one milky white eye regarding her with concern. "Very well. See how effortlessly you become unraveled." All at once, the Sha and all of the other monks disappeared, and Weipon was face to face with...herself? This Weipon appeared as Liu had, face pinched, fur dull and gray, and most importantly, incredibly hostile. "Well, if it isn't the little cub who left her Mama and Papa behind," the sha sneered, launching into a series of punches. "Too weak-minded to make your own decisions, you let those Horde strangers talk you into abandoning the most important people in the world to you." "And now," Weipon continued, this time landing a kick, "now you're letting some foreigner you just met boss you around! What a disgrace!" She swept out a leg, knocking her opponent down fast enough to pin her. "And instead of fighting back, you just let all that anger boil up inside..." She pressed their noses together, breath ghosting over her opponent's lips. "Let it get the best of you..."
Was that true? It was true, wasn't it? She had lost control, behaved like a mindless animal in front of her peers. The monk's struggles weakened as she retreated into her own thoughts. But wasn't there a reason for her anger? And she had learned something that day, an important lesson. "That's right," Weipon continued with a mocking smile. "You're angry at the orders you're getting; you don't like them but you're too weak to argue, to disobey." The monk strained weakly, nose wrinkling at the disgusting odor that washed over her with Weipon's cruel words. She stank of...of sha. Sha! The Sha of Doubt, which was taking over the Temple! "No!" Weipon shouted, bucking her hips up against her sha-copy, unseating her and sending out a reassuring peal of the bell. She wrestled with the sha-copy, flipping her into a pin of her own. "I didn't abandon my parents; I believed in going to explore the world; I can and will master my emotions!" Her hands closed around the abomination's throat. "I will not let the Horde make me compromise my morals," she added fiercely. Rather than fight back, the sha-copy snatched at her belt, grabbing at the bell even as it blistered and blackened her unnatural flesh. Before Weipon could stop her, she crushed the tiny bell in her fist, sending up a great gout of smoke and the scent of charred meat. "If you won't go quietly, so be it," she said snidely, and promptly disappeared. Crouching atop empty air, Weipon fell the few inches to the ground and landed painfully on her knees. She whipped around, taking in the sight of each of her comrades fighting their own demons. Others were overcoming their own doubts, but she could also see bodies of those who had not. Nearby, she could see Akabeko, on her knees and staring resolutely at the ground. Before her stood her sha-copy, laughing as she brought a fist crashing down against her skull. Akabeko staggered, righted herself, and waited for the next blow. The sha-copy's knuckles were split and ragged, and Weipon could smell the foul black blood from where she was. Letting out a furious cry, she propelled herself into the tauren-shaped sha, channeling all of her remaining strength into wiping it from existence. It looked at her in obvious annoyance and said, in perfect Pandaren, "You are entirely too much trouble," before ramming one blade-shaped shadowy appendage into her gut. Losing all semblance of tauren features, the shadow retreated, flowing to rejoin the Sha of Doubt's quivering mass. It sneered at the remaining pandaren, its grotesque mouth a too-wide gash in its face that glowed bright white. Weipon stopped watching, although she was dimly aware of the sounds of fighting and the overwhelming presence of something ancient and benevolent hovering just outside the doors. Her hands skittered over the hole in her tunic, where the shadow-stuff had punched through the leather of her chestpiece and sliced neatly into the soft flesh beneath. Blood seeped unendingly from the wound, and it reeked as if infected. She knew she should press against it, staunch the flow, but it hurt so much to even touch...! Tears blurred her vision and her breaths became shallow pants. As panic began to set in, however, a face swam before her eyes. "Wei. Wei! Weipon!" Then, unexpectedly, in Pandaren, "Weipon, look at me!" She concentrated until the face came into focus. Akabeko looked inflated, cheeks and lips split from being beaten, nasty bruises puffing up along her jaw. "There you are," she continued in Orcish, hands covering Weipon's to press them firmly against the wound. "You got your happy bell on you?" When this earned little more than a panicked gasp, she shook her head. "All right, that's not terrible. We made it this far without one, right?" While Akabeko talked, Weipon could feel a faint, warm tingling around the wound. "This is hardly the worst thing I've ever seen," she continued, all bravado. "I've got it all under control; don't you worry." Weipon gave a tiny shriek as the pain spiked. The scent of decaying flesh thickened, prickling across her skin as it spread up her ribcage, down to her hips. Akabeko's face contorted, and she laughed bitterly. "Just like riding a plainstrider; you do it once, you never forget how," she muttered. The warmth under her hands increased to a light tickle. "Come on," the druid continued, mostly to herself. "If you can't even do this, what good are you anyway? She got you this far; you owe her twice that." She groaned, a long, bitter wail, and squeezed her hands around Weipon's. Briefly, Akabeko's eyes glazed over blue, and the sensation at Weipon's middle increased to a comforting pulse of heat that thrummed through her body. She could feel the very unpleasant moment when her skin knit itself back together, followed by an itch that crawled its way across her skin as the infected flesh returned to normal. Weipon clumsily pulled up her shirt, running her fingers over the space where a hole had been opened into her guts. Now there was only smooth, unbroken skin and healthy fur. Akabeko sat back with a great sigh. Breathing heavily, she absently brushed a handful of clinging vines and leaves from her forearms. She looked at Weipon and smiled wryly, revealing a freshly-chipped tooth. "Let's never do that again," she suggested, and helped Weipon to her feet. 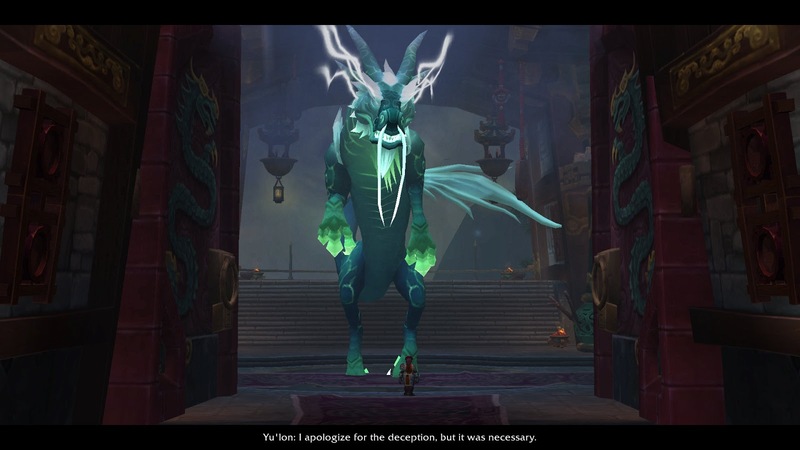 Sometime after defeating the sha doppelgangers, the monks had managed to open the doors for Yu'lon and defeat the weakened Sha. They were taking stock of their losses when Akabeko and Weipon rejoined them, and Weipon gratefully accepted a reassuring hug from Peng. He looked haunted, as did many of the other pandaren who were clearly still dwelling on whatever doubts their sha-copies had thrown at them. Weipon glanced at Akabeko, recalling the brutal scene she had witnessed, but the tauren's face was a careful mask. The Sha is not completely gone, but merely imprisoned once again, Yu'lon said solemnly. Without my rebirth, I am too weak now to do more to contain it. She shut her enormous, liquid eyes in apology. I thank you for your service, my loyal followers. The pandaren smiled wearily at each other, pleased that for the time being their beloved Temple and its beloved deity were safe. Vacation vacation! Mainline all the games! But first....I got locked out of the server. Again. I reopened my ticket from a few weeks ago to let them know that the system check done on Blizz's end was giving me Battle Net Error #105 (it flashes so quickly that it took a LOT of failed logins to read the number). This time around, I was directed to an already-locked forum post in which the only recommended fix was player-suggested and came with a blue caution: "We do not actually endorse this method." Anyway, that fix didn't work. Later, I got another CS response informing me that my issue was resolved because something related to ATT service, which I don't have. I still couldn't log in, and reopened my ticket, and this time they told me that since I'm in Japan they don't actually care about any issues I may have. I'm trying real hard to be nice to you, CS employees of the world, but....!! I eventually found a workaround from another thread, and since then I've been playing, playing, playing! I cranked up the music, because it's been a while since I listened to the actual in game sounds rather than a podcast or TV show. The Pandaren inn music is really the greatest. I even did some dailies on Aka, which hasn't happened in weeks! Much twitter rejoicing was had. I finally got Weipon to level 85 and rushed to Jade Forest, all ready to have my HEART BROKEN INTO PIECES. Since I first did the questline leading up the Temple of the Jade Serpent, I've been really impressed by the impact of the final scenes. Well, you read the story, you probably know exactly how much. Finally getting to do it on the character I had intended to experience it was really intense! Even better, now that I'm questing and taking notes on all the fun scenes that can play out, I'm starting to think about the future of the story! you are my favorite, yes you!! Thank you very much to those of you who replied to the podcast post! Due to crappy RL schedules, we won't be recording until this coming Saturday, but since I don't intend to do anything very fancy with the audio, it should be uploaded quickly. If you have any more burning thoughts, be sure to get them to my inbox before then! red cow rise by akabeko is licensed under a Creative Commons Attribution-NonCommercial-NoDerivs 3.0 Unported License. Game of Thrones is changing EVERYTHING! Halt My Grind Promo | Listen to the whole song on Kavo's channel! The Slowest Leveler in All of Zandalar? Big Things are Coming and Woot…Post 100! minipost: Update your link please! Steam Family Sharing now active!